When applying your eyeliner think pressure not speed! 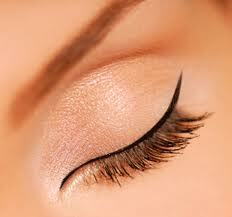 Close your eye & hold your eyelid taut-no need to strech the lid down or outward. Press the liner firmly along the lash line in little tiny dashes until you reach your stopping point. Next, connect those dashes with 1 smooth swoop across the eye! Don’t worry if you can’t get it the first time…it takes practice!